Hear our cries, come set us free. Give us hope and faith and gladness. Show us what there yet can be. Amen. Give us grace to cast away the works of darkness. We pray those words this morning with a deep awareness of the darkness and division dominating the discourse in our nation, the violence and oppression dominating the world news and the sad truth that the peace on earth, goodwill to all incarnate in the One whose birth we prepare to celebrate seems further away than ever this year. When she spoke at our Diocesan Convention in 2008 then Presiding Bishop Katharine Jefferts Schori called Advent “the season when Christians are called to live with more hope than the world thinks is reasonable” … and not surprisingly her words ring even more true to me today than they did eight years ago. Nevertheless it is our call – it is our challenge – it is our opportunity – to choose hope … even when we’re not feeling very hopeful. God, there are days we do not feel hopeful. When we are anxious or angry. When we feel alone. 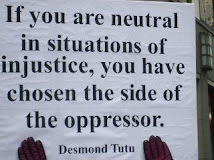 When we do not understand what is happening in the world, or with our neighbors. God, this Advent, we do not feel hope. We choose it. And we will make hope, with strong hands and courageous hearts. Show us what there yet can be. We light this Candle of Hope with prayers of thanksgiving for those choosing to channel their anger and muster their courage by mobilizing around the shared values of love, justice and compassion. Those who gathered in solidarity at the Dolores Mission last week to organize for resistance in the wake of the presidential election. Those who stand with water protectors at Standing Rock as winter descends onto the North Dakota plains. Those who work to guarantee that the equal protection guaranteed by the Constitution equally protects all – not just some – Americans. For all those refusing to accept what is and showing us what there yet can be. We choose hope as the armor of light we put on during Advent -- light that is a light to ALL people … especially those already marginalized and oppressed by the systemic “works of darkness” we name as the racism, sexism, homophobia and nativism that pervaded our civic discourse during the election cycle. Rather -- for me -- this election cycle and its aftermath is like a rock that gets turned over in the garden and out from under it crawls all sorts of creepy, crawly, slimy, scary looking things that have been there all along but now we have no choice but to see them. To deal with them. Those of us who have been protected by our privilege up until now from having to deal with them can’t “unsee them” – even if we want to. We can’t just put the rock back and pretend they’re not there. For the truth is that this election told me what my head already knew: that we are a nation deeply divided and that the deep-seated combo of privilege and patriarchy are powerful roadblocks in the decades old journey toward making liberty and justice for all in this nation not just a pledge we make but a reality we live. The irony that liberty and justice won the popular vote is small consolation as the dust settles and we watch white privilege and patriarchy poised to dismantle the safety nets and protections attempting to guarantee equal protection for all – not just some – Americans. And so to my well meaning friends and colleagues – and some relatives -- who have quickly moved to calls to “wait and see” and “hope for the best” my response is this quote from Rabbi Abraham Heschel: “Patience is a quality of holiness, but it may be sloth in the soul when associated with the lack of righteous indignation.” As a Christian – as a priest and pastor – I am righteously indignant at what is happening in our nation not in spite of being a follower of Jesus but because I am a follower of Jesus. Advent is time for hope -- not a necessarily a time for patience. It is a time to use our collective righteous indignation as fuel for the holy work of resistance. It is a time to recognize that as the dust continues to settle one aspect of our post-election reality is the pulverization of the silos of competing oppressions that have too often separated us from those who are in fact our allies in the larger struggle. This is no longer some straight people standing with gay people because their right to marriage is threatened; this is no longer some Christians standing with Muslims because their Mosque is under attack; this is no longer some white allies marching in Black Lives Matter protests or some cisgender folks showing up in solidarity on the Transgender Day of Remembrance. This is all of us under attack at the same time by the same agenda – an agenda antithetical to the core values of both Christianity and the Constitution. 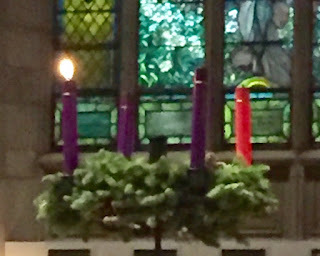 If we’re not righteously indignant we’re abdicating our responsibility to both our faith and to our country – and it is my prayer this First Sunday of Advent that our indignation will fuel our commitment to choose hope … even when we’re not feeling hopeful. For when we choose hope -- when we put on that armor of the light of love, justice and compassion -- we can move again into active participation in bending that arc of the moral universe a little closer to justice by our shared witness to the God who created us all in love and called us to walk in love with each other. When we choose hope we not only can – we will – cast away the works of darkness. A bullet may have silenced Harvey Milk – but it did not silence the hope his life, work and witness inspired. May his example challenge us to refuse to allow an election to silence the hope that is in us as we continue to look for ways – large and small – to cast away the works of darkness with the light of God’s love, justice and compassion. For some of us, one small way has been wearing a safety pin as an “outward and visible sign” that we are a "safe place" – and that we will stand up for the rights of every single person. Now let’s be clear: Thinking you can stick a safety pin on your lapel and make liberty and justice for all a done deal is like hanging a cross around your neck and thinking you've made the kingdom come on earth as it is in heaven. It's just a sign -- just a symbol -- of the commitment to be part of the solution. It is an icon of solidarity that transcends all the labels that have been deployed to divide us. It is one tiny way of taking hope out into the world – of refusing to be silent – of speaking hope to a world in desperate need of it. For me it spoke one morning in line at Starbucks. As I waited patiently for my grande drip with room for cream, a young woman in a hijab turned from the counter with her Venti something-or-the-other in her hand and looked at me standing there with my big fat safety pin on my shirt. She smiled and nodded her head ever-so-slightly ... and in that moment of recognition I got all I needed to tell me that wearing a safety pin can be one of the ways we work to cast away the works of darkness – a tiny but concrete way to choose hope as we journey together beyond the world as it is to the place God would have it be. Come, O Christ and dwell among us! Hear our cries, come set us free. Set us free to be the change you call us to be. Set us free to live your love. Set us free to be your justice. Set us free to journey into the adventure of God’s future this Advent and always. That data tells me what my heart already knew: that I am not alone in my struggle to process both the immediate impact and the long term implications of an election giving the most divisive and unqualified candidate in the history of politics the power to implement the misogynistic, racist, homophobic, Islamophobic, nativist, xenocentric policies which were the hallmark of his campaign. The irony that liberty and justice won the popular vote is small consolation as the dust settles and we watch white privilege and patriarchy poised to dismantle the safety nets and protections in place to guarantee that equal protection equally protects all – not just some – Americans. To my well meaning friends and colleagues who have quickly moved to calls to “wait and see” and “hope for the best” my response is this quote from Rabbi Abraham Heschel: “Patience is a quality of holiness, but it may be sloth in the soul when associated with the lack of righteous indignation.” For as a Christian – as a priest and pastor – I am righteously indignant at what is happening in our nation not in spite of being a follower of Jesus but because I am a follower of Jesus — and not feeling at all patient. This is not a time for patience. This is a time to use our collective righteous indignation as fuel for the holy work of resistance. This is a time to recognize that as the dust continues to settle one aspect of our post-election reality is the pulverization of the silos of competing oppressions that have too often separated us from those who are in fact our allies in the larger struggle. This is no longer some straight people standing with gay people because their right to marriage is threatened; this is no longer some Christians standing with Muslims because their Mosque is under attack; this is no longer some white allies marching in Black Lives Matter protests or some cisgender folks showing up in solidarity on the Transgender Day of Remembrance. This is all of us under attack at the same time by the same agenda – an agenda antithetical to the core values of both Christianity and the Constitution. And if we’re not righteously indignant we’re abdicating our responsibility to both our faith and to our country. I thought by now I’d be less nauseous. But now that I think about it, I was nauseous for nine months twice – and ended up with two great kids to show for it. That was then and this is now. And now ... in this moment ... the stakes are way too high to let waves of nausea at every breaking news update immobilize us. Way too high. So count me in. Count me in for reconciliation where it’s possible and resistance where it’s not – and count me in for solidarity in the struggle until liberty and justice for all finally becomes a reality we live, not just a pledge we make. "When the going gets tough, the tough light candles." OK -- I made that up. But here at Casa Mountain View it's true. Make no mistake about it -- we also [a] get going [b] keep giving [c] keep organizing and [d] keep networking ... but we also keep praying and -- in our case -- keep adding to our "Election Shrine" on the sideboard of "outward and visible signs" of what's at stake in this election representing our prayers and positive energy being sent out into the universe. 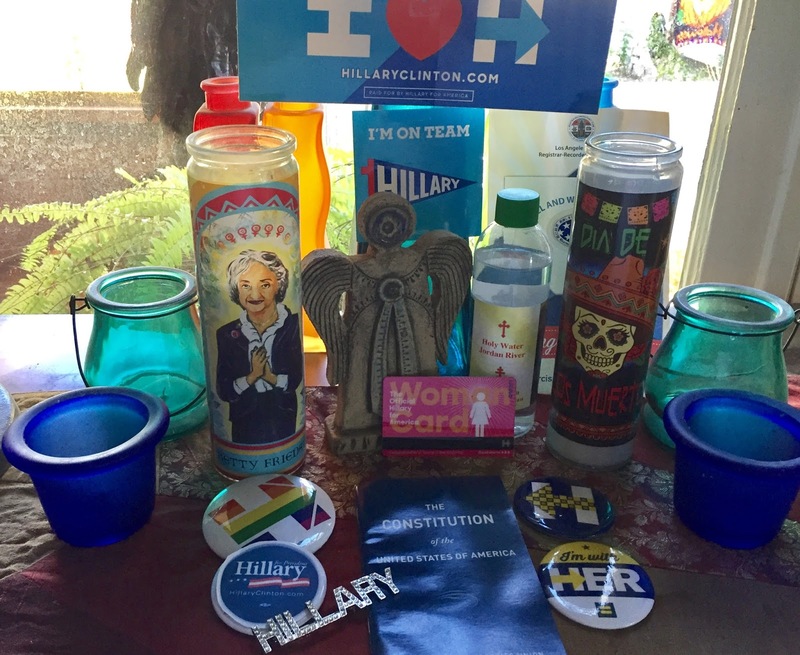 From the Hillary swag to the Betty Friedan "secular saint" candle to the Constitution to the Jordan River Holy Water given to me by my sister-in-law's Jewish partner (I know -- seriously!) it just keeps growing. Along with my conviction that this is arguably the most important election of my lifetime. Finally, I am inspired by the aspiration to "make America whole" -- which I hear as a paraphrase of the liberty and justice for all I've been pledging to work for since I learned to put my hand over my heart and turn to the flag in kindergarten. And I am convinced in order to do that we need everyone at the table -- and that we need a President who has the hope, the vision and the track record to not only secure the advances of the past eight years but move us into the future. This will be the 12th Presidential Election in which I've had the privilege to vote. I have never not had some reservations about the candidate I supported -- and that includes Hillary Clinton. I wish she had been stronger earlier on LGBT Equality. She is more of a hawk than I would like. I disagree with her on the death penalty. 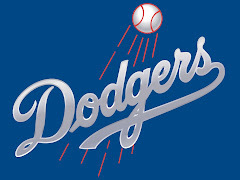 And ... all things considered ... I do not believe I ever cast a vote for a more qualified candidate for President than I did when I (early) voted for her.